Back in April 6, I received my Coleus order from Rosy Dawn Gardens. I finally was able to upload photos of my order. 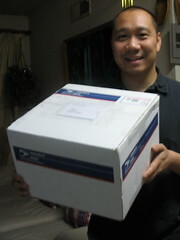 Click the above photo of me with my package to view my flickr photo set entitled “(Coleus Order from Rosy Dawn Gardens“. It contains 10 photos of my order including my 16 new Coleus. This entry was posted in Uncategorized and tagged coleus, flickr, rosy dawn gardens. Bookmark the permalink.